Long before there was a modern state of Israel, activists working toward its creation were divided between those most concerned with founding a state for the Jewish people and those hoping to create a Jewish state. In other words, they were divided on the question of whether the new nation’s primary purpose would be a safe homeland for people who faced active discrimination elsewhere, or a state governed by Jewish religious law. Even with the founding of modern Israel in 1948, however, a number of factors—such as instantly fighting its neighbors in a war for independence—meant decisions like passing a constitution or otherwise codifying the role of religion in governing the nation ended up being kicked down the road. 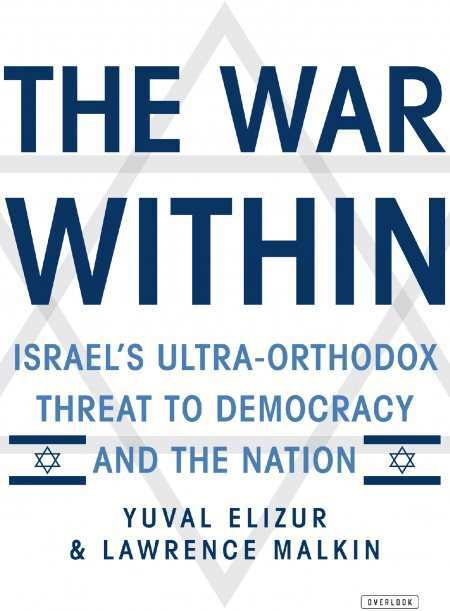 In The War Within, veteran journalists Yuval Elizur and Lawrence Malkin examine how the unresolved question of temple-state relations impacts government policy and everyday life in Israel today. They focus on the role of the Haredim, the ultra-Orthodox minority that they see as wielding outsized influence. The book traces this conflict between the ultra-Orthodox and Israel’s more secular majority from the time of the settlements that predated the British mandate to the Knesset of today. Because Israel’s parliamentary system means that Haredi support is key for parties when building a political coalition to govern, the authors believe that their influence has too often forced the majority to kowtow to the Haredim. For example, Haredim are exempted from the military service required of all other citizens, while the state subsidizes their yeshiva studies well into adulthood. Because these yeshiva students don’t receive instruction in subjects like math and science, many are permanently unemployable outside of religious settings but nonetheless receive government stipends during their studies that are not available to students at Israeli universities. Elizur and Malkin cite clashes between Haredim and the majority regarding equal rights for women, such as a recent court case spurred by a bus service segregating men and women per Orthodox tradition. They also point to Haredi rules on recognizing marriage and divorce, policies on Sabbath observance, and their refusal to acknowledge the ceding of territory to the Palestinians as areas where tensions continue. Through all these examples, the authors argue that the influence of this ultra-Orthodox minority and its insistence on Israel as a Jewish state has become more of an issue over time, as the Haredim have become more comfortable with influencing public policy and the rest of the country has grown more secular. The book serves as a solid, interesting primer on this ongoing conflict and its history.